When you ask most Denver visitors about beer, Coors Brewing Company most likely comes to mind. Although the Rocky Mountain freshness of Coors may be the beer that takes you out to the ball game, did you know this town offers a multitude of high end pubs and breweries offering their own distinct character as well as traditional Irish ale houses to tap in to? To really experience what this town has to offer, start your morning off right with a stop at Cheeky Monk Belgium Beer Cafe in the Capitol Hill neighborhood. Indulge in a breakfast delight such as a Belgium sugar waffle topped with an icing of your choice and complimented with Leffe Blonde –a citrusy, sweet pale ale. In fact, most appetizers and meal selections are carefully paired with one of the thirty-six Belgium malt beverages either on tap or bottled. A refreshing change of pace, Cheeky Monk has a classy wine bar feel, yet, provides reasonably priced meal selections and top notch service. As one would experience in Europe, enjoy a Chimay Triple or other fine beer in the proper glass which it was intended to be served in. Before heading to your next destination try another Belgium favorite such as fresh mussels prepared one of five different ways. A short walk from Cheeky Monk is Denver’s best Irish Pub: The Irish Snug and has been given prestigious local awards from 5280’s Top of the Town to the A-List. Here you can enjoy a selection of Irish beers, live entertainment and Trivia Tuesdays. Happy hour specials are offered every day of the week to satisfy your wallet and cravings. Call ahead to reserve a table for a true Irish experience. In the 19th century these small, private rooms, called a “snug” would provide privacy to individuals visiting the local pub that wished not to be visible by other patrons. While in the snug, if you thirst for Ireland’s best beer–a Guinness Draught is just what you need. The Irish Snug staff will perform the infamous two part pour of your pint of Guinness, topping it off with a white, creamy head. As the malt and caramel flavors hit your taste buds, you will realize that the wait was time well spent! A beer enthusiast would agree nothing is more satisfying than a refreshing pint straight from the aging cellar to your glass. 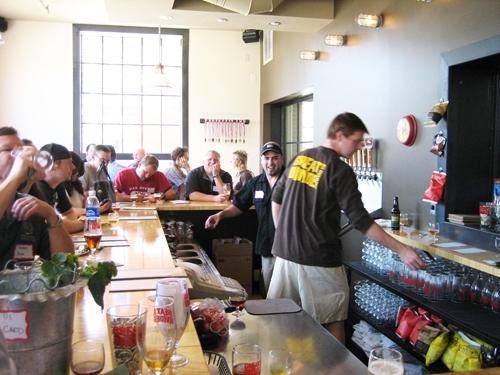 Visit Colorado’s oldest brew pub, the Wynkoop Brewery, any Saturday between 1:00 to 5:00 pm to partake in a brewery tour with one of the knowledgeable Brew Masters. The tour begins with the fermenting process, visits the aging cellar, then the onsite mill room where grains are carefully selected to create Wynkoops signature beers. Although a small operation in the heart of Denver, they produce some fine and refreshing beers from their flagship Railyard Ale to the Patty Chili Ale which has a distinct flavor of Anaheim chiles and smoked ancho peppers. After consuming a beverage or two head upstairs to one of the largest billiard halls in Denver for a few rounds of pool. Every year Wynkoop crowns a Beer Drinker of the Year. Contestants submit a beer resume explaining their beer drinking philosophy and highlighting their passion for the malty beverage. Three contestants are flown to Denver to battle for the coveted title of “Beer Drinker of the Year”. This is an event that is celebrated by all as glasses are raised to toast to the winner’s admired accomplishments. The competition typically takes place in February however, if you are interested in applying to be the Beer Drink of the Year, deadline is December 31st of the previous year. Next, head to the Great Divide Brewing Company where the motto is ‘Great Minds Drink Alike’ and you will understand why when sampling their intense, flavorful concoctions. Since 1994 they have pleased locals with not only their beer, but extra’s like their very own beer tasting room. Tours are every hour on the hour from 3:00 pm to 8:00 pm Monday-Friday, and 2:00 pm to 7:00 pm on Saturday. Tours begin in The Tap Room where you will be presented with a pleasing menu of ‘The Beers’ and ‘The Really Big Beers’ with alcohol contents up to 10.2%. Score seats at the end of the bar which has a bay window that provides you with a view of the bottling and packaging area of the brewery, just enough to tease the beer enthusiast until the actual tour begins. Grab one last draught of Ridgeline Amber Ale or a Wild Raspberry Ale before the tour because there will be plenty to raise your glasses to. Toast to the pure joy of drinking fine beer, the 100 gallon fermenting tanks or to the many green features that are incorporated into the brewery from production to consumption. Great Divide recycles all of their paper, cardboard, plastic, glass and scrap wood while local farmers collect the malted barley used for brewing and feed it to their livestock. Giving back to the environment does not stop there for the Great Divide. The brewery donates all proceeds from beer sampled in the Tap Room to the Colorado Environmental Coalition to help in their conservation efforts. What a great excuse to raise your pint glass while helping support a great cause! Are you feeling crafty? Why not test your homebrew skills in the annual Great Divide Brewing Company Big Beer Homebrew competition. Grand prize winner will be awarded the opportunity assist with the brewing of one 50-barrel batch of their amazing beer. Competition takes place in June, however now is the time to begin creating that award winning brew. Who knows maybe you will craft a beer as potent and as tasty as their Old Ruffian Barley Wine Ale. The final tour of this day devoted to water, barley, yeast and carefully selected hops is highlighted with, of course, more refreshing local microbrew beers and tangy BBQ at Denver’s Breckenridge Brewery Bar-B-Que. Regular tours of the facility are offered throughout the week by appointment or they have open tour days on Monday and Thursday from 11:00 AM to 3:00 PM. Interested in the VIP tour privileges that will allow you to “dive into” the brewery for some behind the scenes extras? If so, save your Breck Bucks from 12 packs of Breckenridge handcrafted ales that you purchase. At the end of this hour and a half personal tour, VIP’s receive a full tasting of all their beers. This tour must be schedule prior to your visit. Whether you have had VIP treatment or the regular tour, have a seat in the cozy tasting room where you can indulge in some Hickory Smoked Pork Ribs, Sliced Beef Brisket, Spicy Sausage or Smoked Wings complimented with an Avalanche Ale or Oatmeal Stout to wash it all down. After touring through some of Denver’s finest breweries you may have the desire to begin home brewing or add to your current home brewing operation. Although the name of the store implies wine making, Stomp Them Grapes is a beer brewer’s heaven! The store has everything you need to build a beer to your liking. Discover numerous specialty grains from around the world, malt extracts and a wide selection of brewing instruments and kits. The educated staff is always happy to share some beer recipes and helpful hints. They even offer homebrew classes. If you are lucky enough to be in Denver in Autumn you will have the ultimate beer drinking experience when you attend the Great American Beer Festival. The festival is a three day drinking extravaganza, but many individuals decide to attend only one or two days of this popular event. The festival is a time for beer drinkers to unite to celebrate the art of brewing by sampling more than a thousand varieties of brews from over five hundred breweries from various regions of the United State. If you need some down time from your consumption to enjoy some of the other festival events you could partake in the beer and food pairing demos, discuss your beer analysis with a real beer judge or visit the American Homebrewers Association for book signings. For a final stop, head to Falling Rock Tap House in Lower Downtown. With approximately 87 beers on tap and serving 400 different varieties of beer from around the world one is certain to experience a number of flavors to excite the pallet. Belly up to the bar to enjoy the establishments chosen beer of the month at a discount price or lounge in the plush leather chairs to sip on one last frosty beverage before your night comes to an end. Click here for more Denver articles and here for more articles by Diane Deering-Gaston. Living in Denver, Colorado since 2002, Diane is a middle school teacher and freelance writer. Her writing focuses on local experiences throughout the state. Visit www.meetup.com/teatimecolorado for local tea meetups throughout Colorado.